Riesling is what I would consider to be the heart of our wine country. It is such a dynamic grape with an astonishing diversity of styles, pure fruit flavors and aromatic qualities. The biggest misconception about Riesling is that Rieslings are always sweet. Actually, that couldn’t be further from the truth! 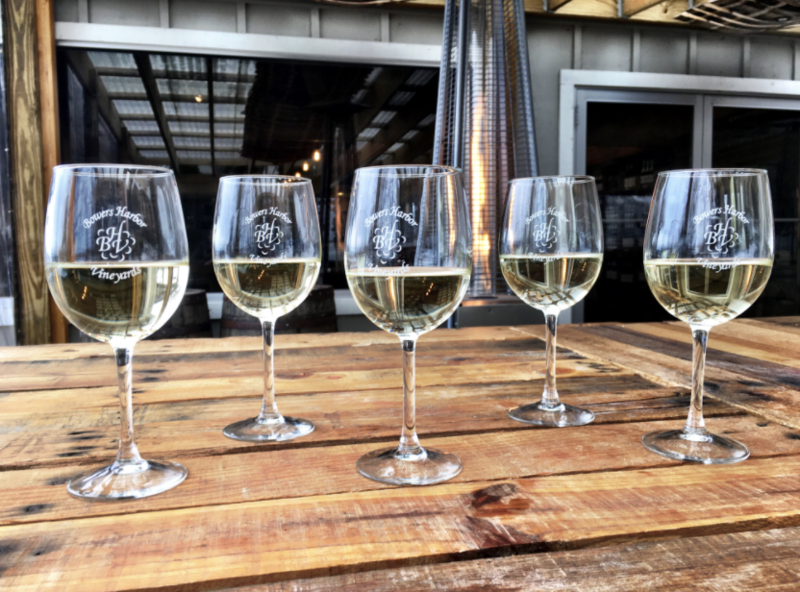 Here at Bowers Harbor Vineyards we have FIVE different Riesling wines, and they range from crisp and dry to dessert-sweet. Did you know that acid is a crucial component in a well-balanced Riesling? Riesling is immediately pleasing, even to new wine drinkers. It’s ALL about the fresh fruit, with no oak or heavy tannins. Michigan wine country has been exploding year after year, and more wine lovers are not only visiting us, but finding out about our wines. While we have a lot of other wines to offer them in addition to Riesling, Riesling is what originally put us on the map. Some of the best Rieslings in the entire world come from our very own backyard. Spencer Stegenga, Proprietor of Bowers Harbor Vineyards, was the first in the state of Michigan to grow and bottle single-vineyard Rieslings. A single-vineyard Riesling is a limited bottling of a Riesling harvested from only one distinct vineyard plot, rather than combining grapes harvested from a variety of locations. The beauty of a single-vineyard Riesling is its ability to reflect the characteristics of its unique terroir (the complete natural environment in which a particular wine is produced, including factors such as the soil, topography, and climate). We did a Riesling staff training last week and I learned SO much! It was fascinating listening to our winemaker talk about the different techniques that went into the wines that he made. It was also very interesting to try wines from all over the world and taste the vast differences between them. Flavor profiles were all across the board, from petrol and ripe fruit to spicy and earthy. Our winemaker, Bryan Ulbrich, was voted as one of the Top 100 Most Influential U.S. Winemakers by IntoWine.com, which is a website that offers expert wine recommendations, wine and food pairings and other industry-specific information from around the world. What makes Rieslings taste different from each other? The fact that we have five different Rieslings on our tasting menu, and that every other winery around also has at least one on their menu, and that they ALL taste different from the next, is (in my opinion) the coolest thing about this grape. Not only that, but Michigan Rieslings will taste completely different than Rieslings from California, Washington, Australia, Germany... you get the idea. Every growing region has its own style and taste due to many localized factors such as: the climate, terroir, micro-climates of the vineyard, farming methods, cultural tastes and of course, the techniques of the individual winemakers. Even vineyards a few miles apart can have striking differences in style. The 2016 Block II was the highest rated wine in a recent James Suckling report, at 93 points. This wine is very dry and really showcases what a single vineyard Riesling from our region can provide: acidity, minerality and spice. I love to serve Block II with buttery scallops or a sharp cheddar cheese. 2016 Smokey Hollow just took home Best of Class at the San Francisco Chronicle, which is the biggest wine competition for American wines. Hints of red apple and grapefruit on the nose while the palate mellows to suggest golden delicious apple and citrus zest. Smokey Hollow pairs perfectly with grilled salmon or lemon pepper chicken. Hand-harvested and lovingly vinified, the grapes for our Medium Dry Riesling are sourced from some of the finest vineyards on Old Mission Peninsula. Each vineyard, with its own unique terroir, offers something a bit different – some yielding tropical notes, some bursting with bright stone fruit aromas, some supplying gorgeous minerality and complex floral and stone aromatics. All those beautiful berries combine to make benchmark Old Mission Riesling. Late harvest Rieslings are among the most beloved of sweet white wines. Our Langley Late Harvest is grown on a beautiful west-facing slope dipping down toward Bowers Harbor. Not harvested until Nov. 1st, 2016, these grapes absorbed all those beautiful, sunny Northern Michigan afternoons and evenings and translated it into an ethereal, sun-dappled dessert-style wine. Novice drinkers will be drawn in by the smooth, sweet fruit-forward character, while aficionados will appreciate the fine balance of sugar and acidity, as well as this wine’s lovely age-ability. There are even more reasons to love a Riesling. Because of its strong acid structure, Rieslings can age much longer than most other wines, white or red. Some of the best Rieslings can still be amazing after 100 years! That is longer than most people live! As the wine matures, the taste will drastically change. Young Rieslings are fruit-forward, very bright and fresh-tasting, but those characteristics soften and mellow after they’ve been bottled for 2-3 years. Then there can be a muted period for up to 10 years (the wine will still taste pleasant) before they gain even more complexity and depth. They become drier to the taste and develop a stronger expression of that inherent minerality, along with a unique petrol character. Going forward, I’ll be thinking of Riesling as the diamond of grapes. It is so multi-faceted! At its simplest, Riesling is an easily accessible wine that can be enjoyed on its own or with food. But tasting a great Riesling can be extremely rewarding, both from a sensory and an intellectual perspective.